Siva in the form of Virabhadra accompanies the mother goddesses as the prime deity. The God is seated in cross legs and shown with four hands.5 All the hands are in kataka in which the front hands are resting on the thighs with the right palm facing up and the left palm facing down. Jatamakuta, makara and pootu kundalas, kandigai, armlets, bangles, head ornament are the ornaments adorn by him. His lower garment is half attire and a snake is seen coiling around his waist as idaikattu which also extends in front of him. The yajnopavita is worn in niveta fashion. Fly-whisks are shown behind the God. All the goddesses are seated in suhasana with their right leg folded flat on the pedestal and their left leg dangling down and placed in sama on the floor but Chamunda has placed her legs in vice-versa. Except Brahmi all the other goddesses are with two hands,6 have placed both their hands on their thighs in kataka, their left hand is holding the excess girdle of the idaikattu. But Chamunda is carrying knife7 on her right hand which is raised up to her head and as like other mothers her left hand is in kataka placed on the thigh holding the extending girdle of the idaikattu. The palm of the left hand is placed sideways. Though the goddesses are uniformly showing kataka the positioning of their left hand varies. Brahmi, Vaishnavi, Varahi have positioned their palm facing up, Kaumari and Indrani palm facing down and Maheswari placed in sideways. As like Virabhadra, Brahmi is also shown with four hands and all the hands are in kataka, front hands placed on the thighs with left hand holding the extending girdle of idaikattu. Upon their attire, Brahmi, Vaishnavi, Indrani are in silk dress draping upto their ankle whereas Maheswari, Kaumari, Varahi and Chamunda are in half attire extending upto their knee. Their lower garment is fastened by hip belt with a clasp in the centre and the excess girdle forming a bow knot in the centre. Besides idaikattu is slackly worn by them to which the knot is held by them in their left hand. Except Brahmi and Chamunda all the mothers are shown with breast band.8 Thick yajnopavita in niveta fashion is worn by all the goddess except Chamunda who is wearing a skull garland as yajnopavita.9 The yajnopavita of Kaumari is double twine and with a brahmasutra. Kandigai, bangles, armlets, kundalas and head ornament are adorned by the Goddesses. Vaishnavi, Varahi are decked with charapali. Brahmi, Maheswari, Kaumari, Indrani are decked with pootukundalas, Vaishnavi in makarakundalas and Chamunda with big patrakundala. Upon their hair dressing Brahmi, Maheswari, Indrani are in jatamukata with head ornament, among them the one of Brahmi is heavy. 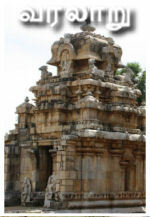 Kaumari and Varahi are in karandamakuta but for the former it is formed as conical with beautifully formed loop in the apex whereas for Varahi it is a flat apex. Vaishnavi is adorned with kiritamakuta and Chamunda is shown in virisadai,10 also decked with ornament. Varieties are handled in hair dressing of the goddess. Though the goddesses are seated in same pedestal the goddess Indrani is highlighted differently with a concaved frame. Chamunda is a unique sculpture in the panel carrying all the daunting attributes. Ganesa is seated in lalitasana with right leg folded flat on the pedestal and the left leg placed upright. The deity is shown with four hands; the front right hand holding a motaka and the front left hand placed on the knee. The back hands are carrying sugarcane in the left and tusk in the right. The right tusk is absent and the proboscis is left turned carrying motaka. Karandamakuta adorns the head, charapali, bangles, armlets are the ornaments worn by him. The yajnopavita is worn in niveta fashion which is knotted at frequent intervals. 3. At Aalatturthali such segregation is not seen. 7. Aalatturthali Chamunda is also carrying knife in her back right hand. 8. At Aalatturthali except Chamunda all are shown with breast band. 9. 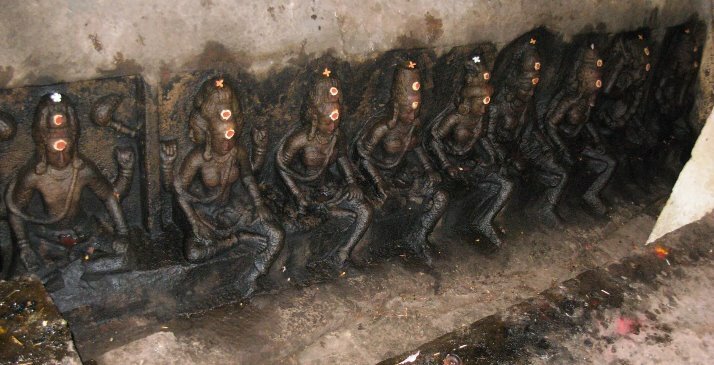 Such feature is absent for Aalatturthali Chamunda, wearing only simple yajnopavita. 10. Aalatturthali Chamunda in Jatabhara.